Fifteen more people have been diagnosed with fungal meningitis in an outbreak linked to tainted steroid injections, health officials reported today. The U.S. Centers for Disease Control and Prevention said it now counted 419 cases in 19 states: 409 cases of fungal meningitis and 10 joint infections. At least 30 people have died. Unlike drug manufacturers, which are regulated by the U.S. Food and Drug Administration, compounding pharmacies are overseen by state boards of pharmacy. 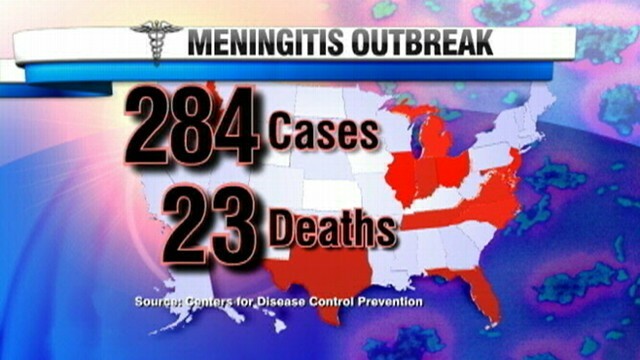 The deadly meningitis outbreak has prompted calls for stricter regulation. "The [New England Compounding Center] has a history of problems, some of which were documented in an FDA warning letter in 2006," the House subcommittee on Oversight and Investigation said in a statement announcing a Nov. 14 congressional hearing on the outbreak. "We want to know what went wrong at this facility, the views and actions of its regulators, and that steps can be taken to ensure such an outbreak never happens again." FDA commissioner Dr. Margaret Hamburg is set to testify at the hearing. The longest duration from the time of injection to the onset of symptoms in the current outbreak is 42 days, according to the CDC. The tainted steroids were recalled 39 days ago.